How Iron Banner 2.0 works and tips on maximizing XP. Cost - 2 motes of light, equip the item and talk to LS. This will wipe all Exp from the weapon and randomly put new stats on the weapon - this is complete RNG, I advise you research which stats you want, work out how many motes of light you can spare... and cross your fingers. 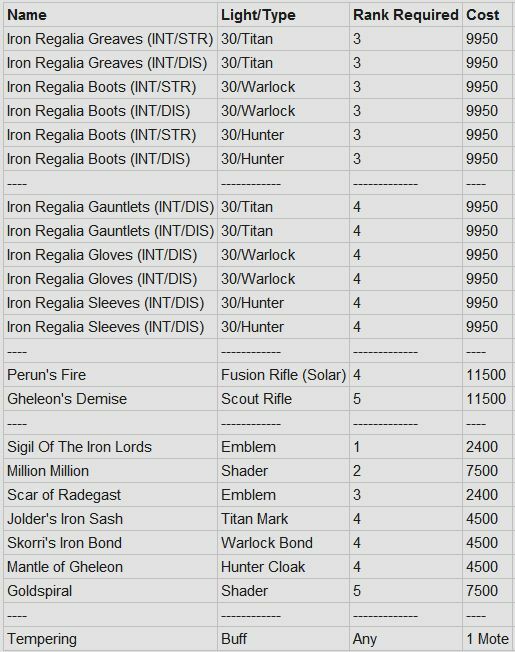 Scroll down to the table with the weapons and choose the one you require. Given 66 exp for a win and 8500 Exp to reach rank 5 you will need 129 wins *not including tempered or bounties. 3. 40 wins to get to Rank 3. 5. 36 wins to get to Rank 5. So that totals to 140 wins. but with temper buffs and bounties it'll obviously be quicker than time spent winning 140 games. WARNING - THIS IS A ONE TIME USE ITEM AND ACTIVATES ON PURCHASE LASTING 12 HOURS!! The potency of this buff increases daily to allow for players with busier schedules to catch up towards the end of the event - however its currently not known what % the buff increases daily. I would advise utilising this towards the end of the week or even Monday if you can hold out that long!